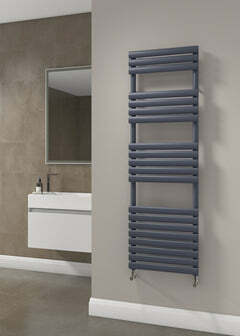 The Carisa Forte Stainless Steel Radiator has a great fresh look, with lovely flat horizontal tubes. The Carisa Forte would be fantastic in any room, especially hallways, lounges, and bedrooms. We now offer the choice of ornate bush ends to enhance the look of your radiator. On many original radiators, including plain column radiators, you will often find an ornate bush end. We strive to achieve a look that is as authentic as possible and now offers this choice to you. These bush ends look amazing with the ornate radiators in our range but also look wonderful with the plain radiators. These bush ends come as part of the design with the Boleyn and Cromwell range but if you would like to have these for your radiator choice please do let us know. To choose the Colour or Special Finish you require, please select the option on the drop down menu, and then type in your choice of finish to the notes box at the checkout. 2 week for all special finishes - additional colour charge will apply. 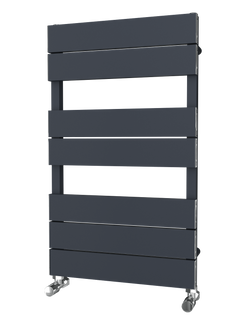 The DQ Modus 5 Column Radiator has a timeless design, taken from its cast iron forefathers has all the style of a cast radiator with the benefits of steel. The DQ Modus 5 Column can be used for both modern and period style applications, coupled with a vast array of sizes and fixings available, the Modus is one of the most versatile radiators on the market. The DQ Modus 5 Column can also be manufactured as a curved or angled radiator, ideal for bay windows etc. Please contact our sales office on 01803 450300 for pricing and assistance. Calculate number of sections – to do this, take the Btu output of chosen section and height from spec table then divide your required output by this number. You have chosen your column depth of 4 columns. Chosen your height of 500mm. Calculated your required number of sections (4.500 = 247 Btu, 6000 / 247 = 25 sections). With 1/2" bottom opposite end connections as standard in RAL 9010 (white). Modus 4.500 x 25 sections in RAL 9010 (white) with wall brackets 1/2" bottom opposite end connections. Length will be 1174mm (25 sections x 46mm per section + 24mm for reducing bushes). The DQ Modus 6 Column Radiator has a timeless design, taken from its cast iron forefathers has all the style of a cast radiator with the benefits of steel. The DQ Modus 6 Column can be used for both modern and period style applications, coupled with a vast array of sizes and fixings available, the Modus is one of the most versatile radiators on the market. The DQ Modus 6 Column can also be manufactured as a curved or angled radiator, ideal for bay windows etc. Please contact our sales office on 01803 450300 for pricing and assistance. 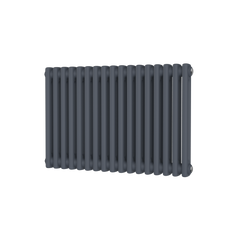 The ﻿DQ Peta 4 Column Column Radiator ﻿is your modern column radiator replicating the cast iron styles of old but in lightweight mild steel. The design enables it to be used in both modern and traditional settings. The Peta can be used in any room in the house, with an almost unlimited number of sizes. It can be made in any number of sections to suit the size and BTU requirements. This DQ Peta is a beautiful 4 column radiator, with it being able to come in so many different RAL colours and special finishes you are able to make it your own which makes it easy to complement the room of choice. To choose a RAL or Special Finish, please choose that option and add to basket. When you get to the checkout there is a notes box where you can enter the colour choice. If you require assistance with this please call us on 01803 450330. The Peta is available up to 6 columns. Each of them pushing out a substantial amount of heat. Made from mild steel, the DQ Peta would look perfect in a living room, dining room or bedroom. The ﻿DQ Peta 6 Column Radiator ﻿is your standard modern column radiator, excellent for people who love the attention to detail as this radiator can come in many different sizes and colours, making it perfect for any style room. This DQ Peta is a beautiful 6 column radiator, with it being able to come in so many different RAL colours and special finishes you are able to make it your own which makes it easy to complement the room of choice. The Peta also has optional slip-on feet - please click here to add. 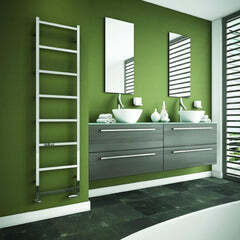 The Reina Alco Vertical Aluminium Radiator is a genius product. It has the perfect combination of modern and classic with it being a column radiator, but it is made out of super modern aluminium! As it is made out of Aluminium it heats up and cools down quickly, with less water content - meaning lower energy costs as a result. This also gets to blazing hot heating outputs. The beautiful Reina Alco, would look great in almost any setting. The Reina Alco is available in 2 beautiful finishes: White and Anthracite. The Stelrad Verona Horizontal Radiator - Single Panel - White has a lovely simple design, with flat panels running horizontal creating a beautiful look. Due to it's subtle design, the Verona would look great in any room in the house. The Stelrad Verona is available in White. The Tudor 4 - 360mm High - 4 Column - Cast Iron Radiator is a very traditional Edwardian type radiator, carefully crafted to offer a versatile choice of heights and widths. The simple column design of the Tudor gives a contemporary feel for the more modern setting as well as an authentic feel for the period home. This stunning Cast Iron Radiator will go with a modern setting due to its contemporary design, as well as equally in a more traditional setting such as a Barn Conversion or a Period Home. The Tudor 4 is available in 4 heights, 360mm, 475mm, 600mm and 760mm and is hand made in the UK. Available in Custom Paint, Farrow & Ball Colours, Antiqued Paint, Highlight Paint, Burnished Finish, Hand Polished Finish. Supplied complete with plugs, bushes, and air vents. The Tudor 6 - 485mm - Cast Iron Radiator - 6 Column is a very traditional Edwardian type radiator, carefully crafted to offer a versatile choice of heights and widths. The simple column design of the Tudor gives a contemporary feel for the more modern setting as well as an authentic feel for the period home. The Tudor 6 is available in 3 heights, 485mm, 660mm and 960mm and is hand made in the UK.